If there is a recipe that my family loves most, this is it! 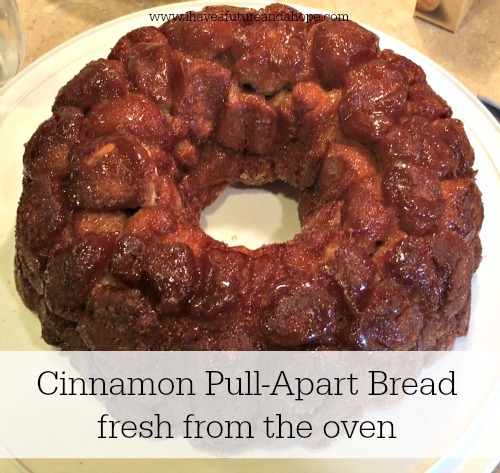 Cinnamon Pull-Apart Bread with Cream Cheese Icing is a tradition in our home around the holidays. Believe me thought when I say you don’t have to wait for a holiday to make this, it will be a winner all year! This is a fun recipe for kids to make as well. 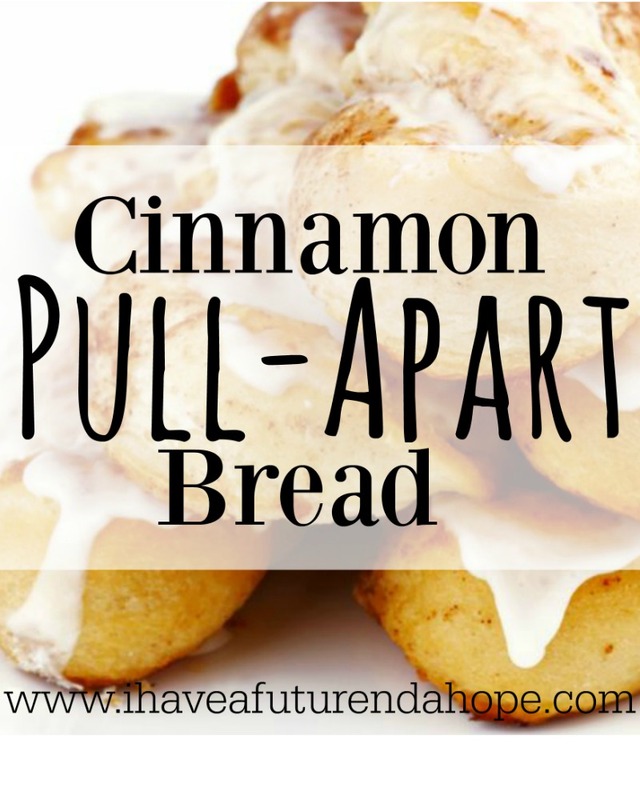 In the YouTube video below you will see my son and I as we make this yummy Cinnamon Pull-Apart Bread together. Now on to the goodness! Mix sugar and cinnamon in a bowl to your liking. I just make sure my mixture has a good brown tint from the cinnamon. Open your cans of biscuits and cut biscuits into fourths or just pull pieces off the biscuit and drop it in the sugar cinnamon mixture, coat your biscuits pieces good with the mixture. Drop the biscuit pieces into your bundt pan. After 2 cans of biscuits have been dropped into the bundt pan melt 1 stick of butter and pour over your biscuits pieces in the bundt pan coating the biscuits. Finish adding the 2 cans of coated biscuits pieces into your bundt pan. Pour the rest of melted butter over the biscuits pieces. Pour the rest of the cinnamon sugar mixture that is left over on top of the biscuits pieces. Bake for 45 minutes or until golden brown. 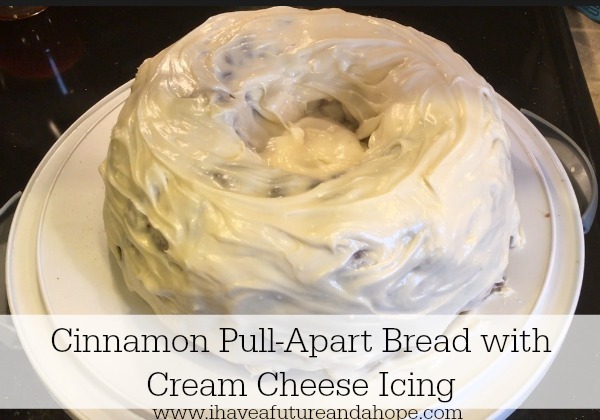 Using a mixer combine the cream cheese and softened butter until mixed smoothly. Add the powdered sugar and carefully mix. Add the vanilla extract to taste. To see more yummy recipes check out the Holiday Bake Hop here! 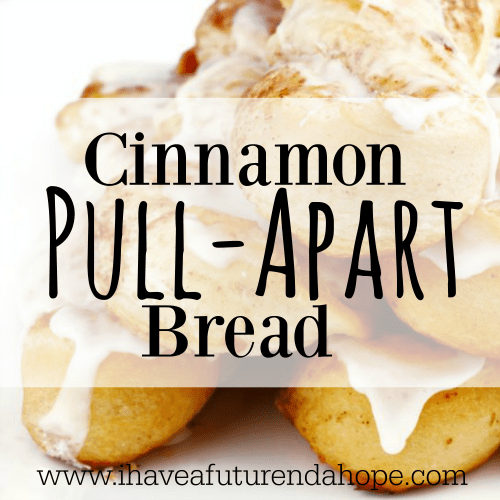 Cinnamon rolls are our favorite things to bake for breakfast on school days around here! Thanks so much for sharing this recipe.. I can’t wait to try it! That looks very yummy! Thank you for sharing. ‘Tis the season for baking! Miranda recently posted…HUGE Reader Appreciation Essential Oils Giveaway! Ok, is it bad to say that I wanted to eat my computer screen? This looks so delicious and I know my family would love this. Thank you for participating in the Holiday Bake Hop. Bake it and you won’t have to! Lol! Oh my! I have wanted to make this recipe for so long! It sounds so delicious and easy! Thank you for sharing! Oh Claudina it is addictive! Thank you for stopping by today! Oh be still my heart… this looks heavenly, I can almost smell it! Oh my goodness, my mouth is watering! That just looks delicious! My mouth waters just thinking about it! Ha. It doesn’t stay around our house long before it is gone. Oh my goodness! This recipe looks completely yummy! My whole family would love it! I can’t wait to add it to our holiday baking list! It is yummy!!!! I’m sure your boys will love it. Alana Satterly is a mom of four kids that keep her on her toes, a follower of Christ, a wife of 18 years, and a lover of peppermint mocha coffee. Her husband is a cancer survivor, and that journey started her love of writing on her blog I have a Future and a Hope where she encourages women to find hope in their faith, home, finances, parenting, and more. Visit Alana@ I have a Future and a Hope's profile on Pinterest.